It’s my turn to present. Mrs Dover is in her usual position – lounging on a desk, elbows resting on her knees, hands clasped – she leans forward, ears primed for grammatical error. My arm shakes as I hold up my book. ‘This is one of my favourites,’ I utter, ‘Ariel, by Sylvia Plath’. Dover, as we call her, is smiling. ‘Why’d you not keep it in better condition then?’ I smile back. I was hoping she’d say that. My Ariel is split into two sections. Literally. 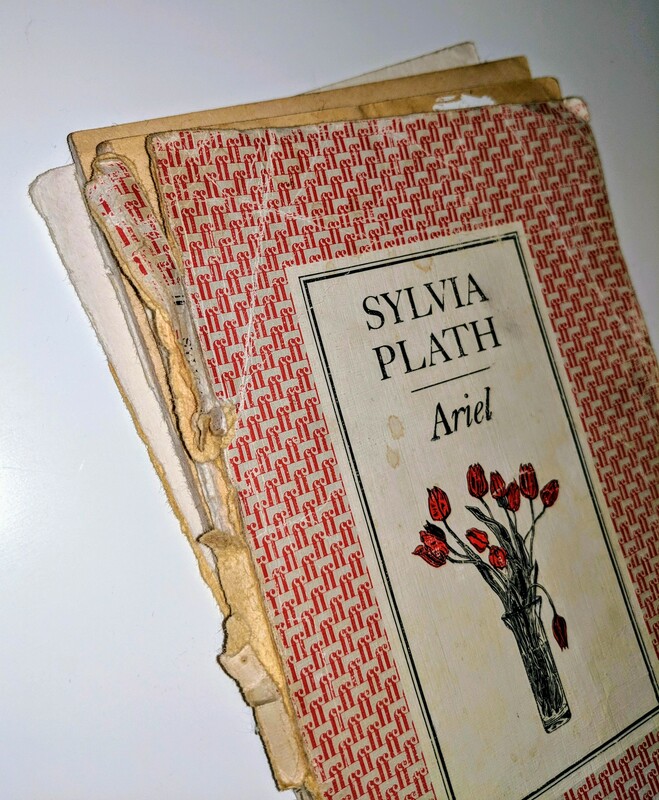 It’s held together by an over-stretched hairband, and its pages are yellowed – or more accurately, tanned, the colour of cardboard – and frayed. There are small tea stains on the cover, scattered like freckles on a face. I explain that it was already second-hand when my sister picked it up in a charity shop. I ‘borrowed’ it and it’s been mine ever since. It’s like a piece of me. ‘Alright’, Dover says, ‘but you’re more than the sum of your parts’. Its previous owner, a ‘Miss Butler’ as inscribed in red biro on the inner sleeve, has Tippexed over a word. I imagine this to be another name, one she chose to erase and replace with her own, perhaps someone she wished to forget. If I wanted to, I could do the same to Miss Butler, though I won’t. I want her to remain. Each scribble is a signature, a breath. In allowing her presence on the page, I keep her alive. This torn little book is not well-preserved, yet it does preserve something that fresh, unmarked copies cannot; something once removed from clean copies, perhaps twice removed from digital ones. Ariel is mine, but I can’t claim it. Its content belongs to Plath. Yet, in being battered and dog-eared, thumbed and annotated, it contains this vague something – something more than the words themselves. A soul, perhaps. Dover asks me how many times I’ve read it. Now I would say that it’s not a question of reading. If a book is simply read, then this is not a book. It is better to say that Ariel is a friend I’ve revisited often. Lines have been underscored and starred, syllables counted, metaphors unpacked. And so, with the help of Miss Butler and a mysterious ballpoint-owner, I’ve learned Ariel’s traits and habits. And I’ve loved her. Sweetcorn for Monday’s dinner, cod and parsley sauce. What else? Tissues, a multipack – she feels a cold coming on. I consider what she might have forgotten, what else she picked up in ASDA. Whether, like me, she usually left the shop with more biscuits than essentials. I wonder just how much this list reveals. Do I conjure her, or do I conjure an image of her – loving, thoughtful, tired? You may presume I have a passion for cooking when you see ‘aubergine’ on my shopping list, because only people I know who cook special dishes cook aubergine. You may also presume I am driven because I have written a list of goals. Perhaps I am a control freak because I write ‘To-Do’ lists daily, or because, if you could, you would see how I catalogue my CDs. You may presume, as I hold my mum’s tattered shopping list, that I am sentimental. It’s just paper, you might say. All lists are sacred. They contain a kind of spell. Dover tells me that I should study English literature at university. It occurs to me that writing a list of tasks is willing them into being. Reading them, too. I know my mum’s list will not bring her back. Still, as I write out what I must accomplish to get to university, another sort of necromancy takes place. Self-belief, resurrected, heaves itself up from all that buried it, pushes through what others said, what they did; all my inadequacies – and in a column of lettering, live as hope. As with Ariel, I feel I must preserve this. I need it. Even when I no longer require it immediately, I can glance at my list and it will reflect me. It will reflect who I am, my successes and failures. Who I strive to become. There are times, however, when destruction is just as necessary as preservation. Evanescence is blaring through my CD player and I am taking a pair of scissors to an expired library book: Shakespeare’s Romeo and Juliet. I cut out Act V, scene III, somewhere around the hundredth line. Dover would not approve. Yet, I can’t help but know this to be an act of love. Romeo declares that Juliet is just as beautiful in death and I declare that these words are just so in their own deaths. I tear them away from the book and pull them into my own realm. I stick them on the wall above my bed. Mine is a possessive love. Narrow in my interpretations, I let my emotions read the work, and therefore I don’t fully comprehend Shakespeare’s layers of meaning, nor want to. I cut through their poetics, the systematic analysis. Simply, I have glimpsed something and it has become a part of me. Booklovers tend to place their most cherished volumes on the top shelf, in mint condition. An act of literal preservation and, I suppose, of selfless love. Or perhaps this might involve giving the book away, entrusting it to another. Soon my entire room is covered in scraps. What I love, what has become a part of me, surrounds me in one large collage. will loosen as you drink. and 1 of us will walk away. 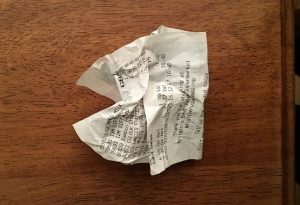 I bin the receipt as I enter my new flat. The walls are a stale magnolia. Suddenly, I am overwhelmed by everything which is not-me, all which is outside of me. I call this blank-canvas syndrome. I fear self-realised nothingness: undefined, unimpactful, no one in particular. I must impose or superimpose myself onto the world. Narcissism perhaps. I am no Buddhist; I cannot let go of the I. If you ask me who I am, I can show you in colour and text. I can play you a song. I cannot, however, tell you. My identity is dependent on scraps – and, like everyone, these scraps are the blocks that form me. In an odd sort of paradox, I cling to the leftovers of others – Miss Butler’s Ariel, my mum’s list, music posters, prints – to remind myself that I exist, and to forge something of myself. Something that says look. Here I am, the sum of my scraps.